World's Largest Bee Is Spotted For First Time In Decades The bee towers over its apian cousins. Females have been recorded as being at least an inch and a half long. Add to that a pair of gigantic mandibles, and it's a bee like no other. One of the first images of a living Wallace's giant bee was captured after a recent rediscovery of the world's largest bee in Indonesia. 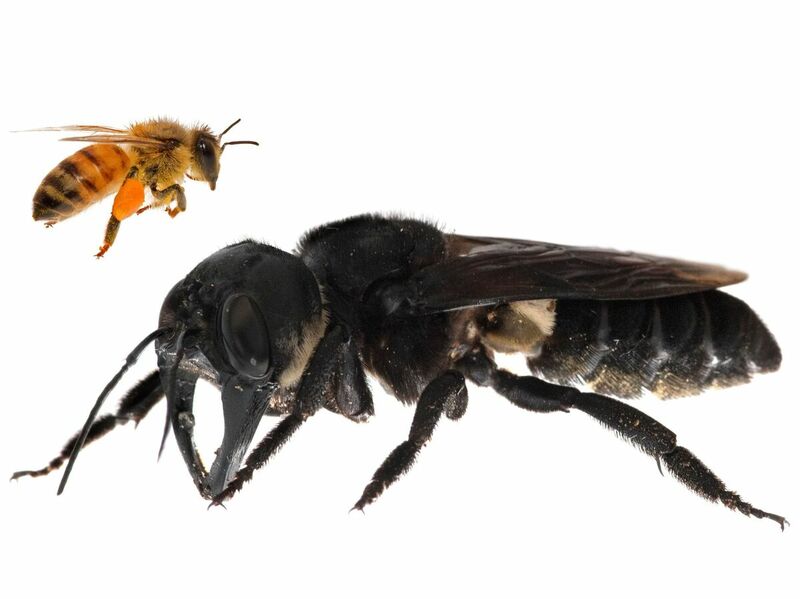 As this composite image illustrates, the bee is approximately four times larger than a European honeybee. You might think the world's biggest bee would be easy to find. But that's not the case: Until recently, the last time anyone had reported seeing a Wallace's giant bee living in the wild was in 1981. That changed in January, when the rare bee was spotted on an island of Indonesia. 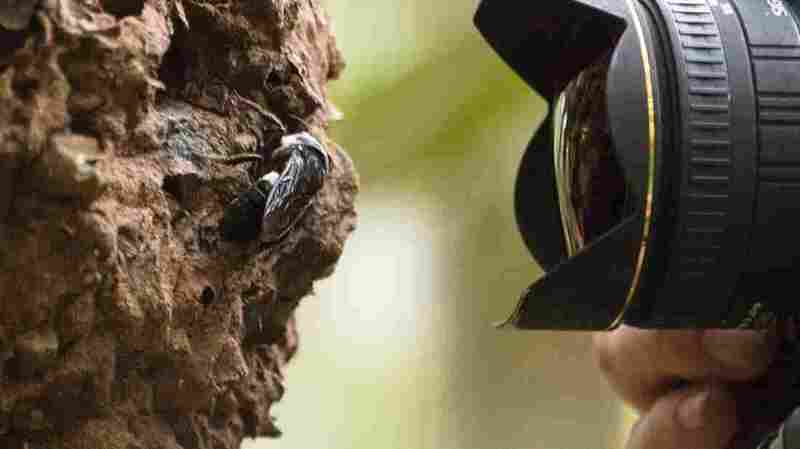 The Wallace's giant bee is photographed by Clay Bolt outside its home inside a termite's nest in the North Moluccas islands of Indonesia. That remote location is a main reason the Wallace's giant bee has been seen so infrequently, said Goulson, who has written several books about bees. And now, he added, that sheer remoteness might help protect it from anyone seeking to get into the bee-poaching business and sell a rare specimen. Bolt and Wyman say they want their discovery to draw attention to the bee — and to the need to protect it. The world's largest bee faces potential risks that range from insect collectors to the loss of its habitat from palm oil operations and other activity. Gibbs agrees with the idea that bringing more attention to Wallace's giant bee might help protect it. He also says there was a flurry of interest last year, when a single specimen fetched a price of more than $9,000 on eBay. "Despite an abundance of potential nesting sites, the bee appears to be rare," Messer wrote of his rediscovery in the 1980s. "Local informants had never seen the bee prior to its rediscovery, although a specific folk epithet, o ofungu ma koana, 'king bee,' is based on it." As has been the case with other historical perceptions about bees, the king bee turned out to be a queen: The females are far larger than the males, which measure less than one inch in length.